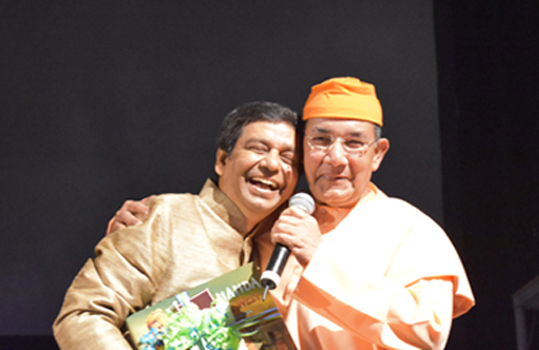 "SWAMIJI" Wins the Heart of Chicago again! The 'Cyclonic Monk of India', as the press dubbed Swami Vivekananda in 1893, stormed Chicago once again with the much acclaimed laser documentary on his life-story. "Swamiji" swiftly won the hearts of Chicagoans. People gathered early at the lobby to visit displays and mementos on Swami Vivekananda. It was a fund raising program for the VVSC, and ticket prices ranged from $125 to $1,000, that proved to be highly successful. 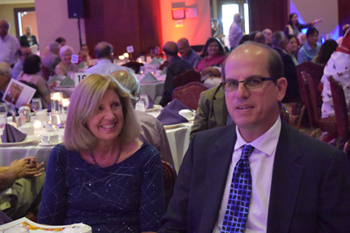 This fund-raising Fall Banquet event was like never before. 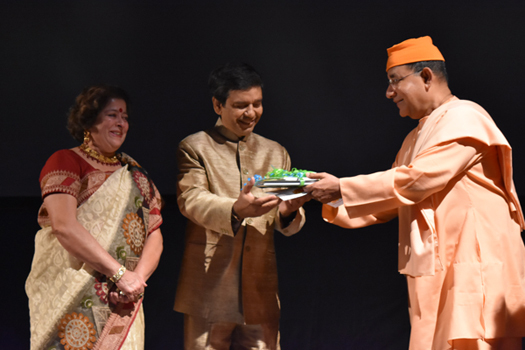 The preparation was going on for months for the organizer (Vivekananda Vedanta Society of Chicago, VVSC) and on September 11, 2016 it climaxed with the hour-long laser documentary on Swami Vivekananda by Manick Sorcar. The venue was the Meadows Club at Rolling Meadows, a suburb of Chicago, Illinois. Portraits of Swami Vivekananda, books, posters, etc. were on display at the lobby, in addition to a full course Indian lunch and tea break prior to the show. 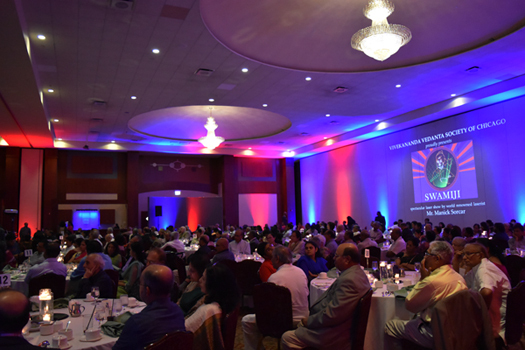 All were a part of the highly successful, well organized annual fund raising program for the Vivekananda Vedanta Society of Chicago. The volunteers, starting from young children to senior citizens - all took active part in this cheerful event that ran for several hours attended by 350 people. The day's program started at 1 pm with a formal lunch served on dining tables within the auditorium. The emcee was Ms. Madhura Sanyal, who did an admirable job throughout the program in addition to singing several melodious devotional songs. 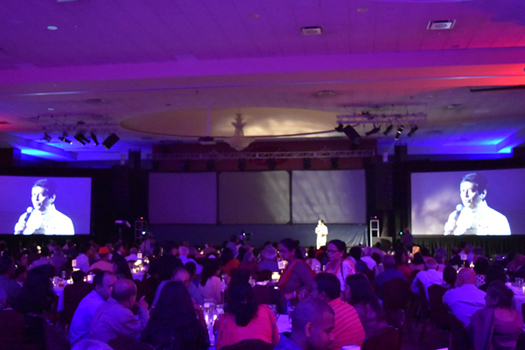 After a heart-warming welcoming address by Swami Ishatmananda and touching anecdotes by Mr. Art Dykstra, the laser show started following the tea break at about 3:30 pm. Manick Sorcar thanked VVSC for giving him the opportunity to perform and spreading the messages of Swami Vivekananda on religious harmony and brotherly love. 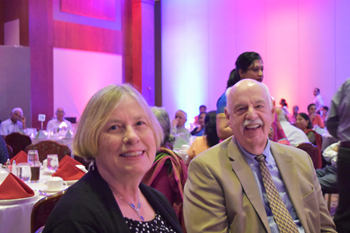 Manick pointed out Vedanta Society is a non-profit organization that brings home the eternal messages of Vedanta to humanity. He said soul's satisfaction lies in service and serving human is divine, the same motto that ties perfectly with the evening's program as will be evident with the life story of "Swamiji". 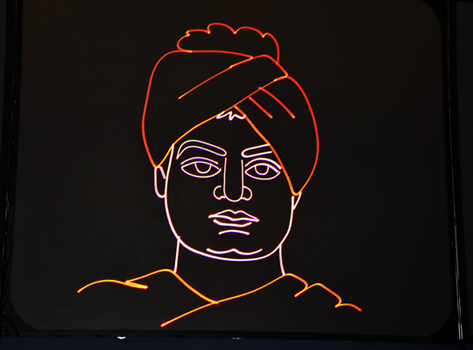 In explaining how a laser is used to draw graphics and animation, Manick Sorcar used a green laser pointer to draw graphics on screen, which magically took over the show leading to the portraits of the Holy Trio (Sri Ramakrishna, Sarada Devi, and Swami Vivekananda) with a Sanskrit prayer, and finally, the laser documentary on Swamiji. The innovative one-hour documentary, which is recorded as the longest laser documentary on a human being, started with black and white original images from the pages of an old picture book which showed famous scenes from the 1893 Columbian Exposition in Chicago before arriving at the Columbus Hall of the Art Institute. There, Swami Vivekananda gives his famous speech at the Parliament of Religions, whose opening line produced a standing ovation that lasted over two minutes. As his message of religious tolerance is carried out and white doves are seen flying from the roof of the Art Institute, the pages flip back to the front page as the black and white images come to life in colorful laser graphics and three-dimensional visual effects to narrate the story from the beginning – all through the medium of the state-of-the-art lighting technology. The complete laser documentary on Swamiji was witnessed by a spellbound audience in pin-drop silence. At the end of the last scene from the show, when Manick Sorcar and his wife came to the stage to take a bow, they were greeted with cheering applause from the jubilant audience, and were felicitated by VVSC. Swami Ishatmananda warmly gave Manick Sorcar a hug on stage and said, "What a marvelous show you've created! I was totally absorbed into the era and could not control emotions". The program ended with a note of thanks from Swami Varadananda. 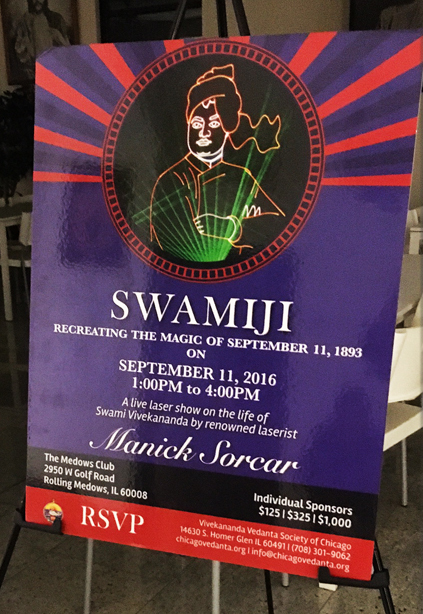 In a personal email to Manick Sorcar, wrote Swami Ishatmananda, "...I would like to offer my heartfelt 'thanks' to you and Mrs. Sorcar for this wonderful presentation on 9/11 on behalf of the Vivekananda Vedanta Society. May the blessings of Swamiji be always with you".